The City of Tallahassee will soon begin a project to address flooding on E. Bradford Road. Work will involve the installation of new stormwater inlets and improvements to the drainage pipes beneath Bradford Road. This project will significantly reduce the severity of roadway flooding that has historically occurred in this area. 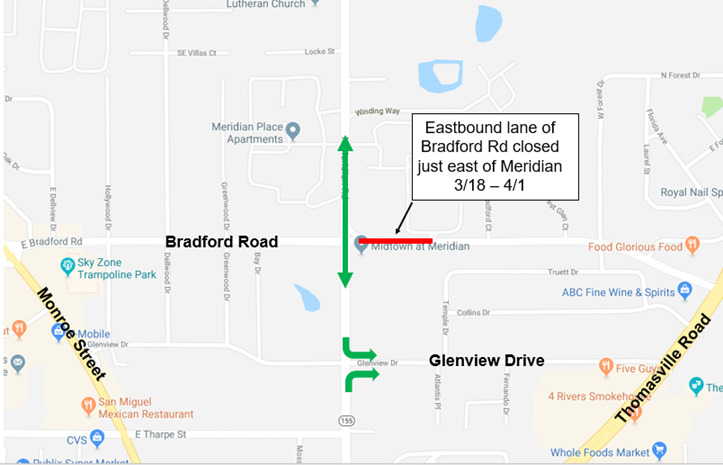 Due to the project, the eastbound lane of Bradford Road will close from the Meridian Road intersection to 700 feet eastward starting on Monday, March 18, at 9 a.m. Traffic heading east on Bradford Road will be detoured south at Meridian Road and then east on Glenview Road. Meridian Road will remain open; northbound and southbound traffic needing to head east will also be detoured to Glenview Drive. The lane closure on Bradford Road is expected to conclude within two weeks. To stay informed about road closures around town, follow @COTTraffic on Twitter. For the latest City news, events and information, follow @COTNews on Facebook and Twitter.